(Nanowerk News) Quantum physics is entering the computer age thanks to the work of a dedicated band of European researchers. It is not that simple of course. While microelectronic chips have continued to shrink in size, research into quantum computing - in which the active components often can be measured at the molecular level - is still in its infancy. The image shows microchips fabricated in the FIRST clean-room facilities at ETH Zurich. 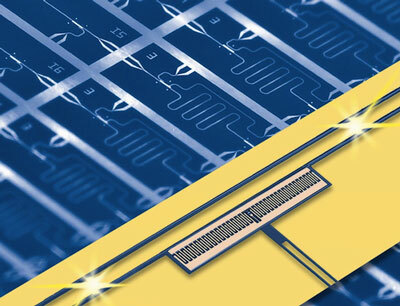 Background: a set of microwave resonators that are used to store and manipulate single or multiple microwave photons. Foreground: a false-color microscope image of a superconducting artificial atom (zick-zack structure). This research has been largely focused on what are known as ion trap quantum 'computers'. Ion traps are chains of up to ten ionised atoms, each of which can be made to behave like a two-level spin-half system, called a qubit. These qubits have the power to represent significantly more information than a bit in a classical computer, and could one day be used to perform certain types of calculations that classical computers can never do. And if large-scale quantum computers can be built, they will be able to solve certain problems much faster than any current classical computers. But before we get carried away, it is important to recognise the limitations of current research: as Prof. Wendin points out, a ten-qubit computer is to quantum computing what a 1950s computer was to the dawning digital world. And there is a further difficulty: present ion traps are not scalable. In order to develop larger systems with 50-100 qubits, solid-state nanotechnology is needed to scale down the components and build microtraps in which ions can be stored. Scaling down solid-state systems has therefore become a focus of current research in the development of quantum computing, and it is where the EU-funded 'European superconducting quantum information processor' (Eurosqip) project comes in. This project has pioneered the development of superconducting electronic circuits by using lithographically fabricated artificial atom qubits in superconducting nano- and microscale electronic circuits. Superconducting circuits have no resistance, and over the past decade it has become evident that these devices can be used as qubits. 'Eurosqip addresses long-term issues in micro-electronics and information technology," says professor Wendin, who co-ordinated the project. Eurosqip, a four year initiative completed in April 2010, builds on the work achieved in two previous European projects: Squbit (2000-2003) and Squbit-2 (2003-2005). Many of the partners involved in Eurosqip worked previously on these projects, setting the groundwork for avenues of research that have been further developed in the current project. Solid-state superconducting circuits have been in development for fundamental physics research since 1985, but according to Prof. Wendin, it was the breakthrough experiment conducted by Nakamura et al. in Tsukba, Japan in 1999 that really opened the door to quantum computing research, and to the impetus behind the Eurosqip programme. By designing and implementing simple yet functional hardware platforms, Eurosqip hopes to make a significant contribution in scaling up qubit systems in practical solid-state projects. Quantum computing certainly opens up some interesting possibilities. For example, a quantum computer has the potential to be much more efficient in integer factorisation than an ordinary computer, which is capable of only factoring large integers if they are the product of few prime numbers. A quantum computer could therefore decrypt many of the cryptographic systems in use today, with implications for electronic security. Furthermore, quantum algorithms could lead to significantly faster query searches than is possible with classical algorithms in use today. While working with solid-state systems opens the door to new possibilities, it also presents significant challenges. One of the greatest challenges is controlling or removing what is known as quantum decoherence; any interaction with the external world causes the system to decohere, an effect that is irreversible. This means that the system needs to be as isolated as possible from its environment, but at the same time open in order to allow programming and readout of information. Controlling decoherence is the key. It is impossible to avoid some decoherence from both communication channels and imperfections in the materials used to fabricate the qubit register. There is no way around this; the only way to go is to continue to improve materials and find better means of controlling this. 'There are no revolutionising solutions in view, just very hard work long term to control the coherent properties of solid matter and solid-state devices,' says Prof. Wendin. Basic funding for personnel and infrastructure for Eurosqip came from national programmes and was greatly boosted by EU funding from the previous 'Quantum information processing and computing' (QIPC, 2005-2009) programme. In the current QIPC programme, Eurosqip is being followed by a new project, also coordinated by Prof. Wendin, called SOLID. Several Eurosqip / SOLID partners have also received prestigious European Research Council grants. SOLID, which runs until 2012, aims to broaden the perspective and include other types of solid-state qubits, such as quantum dots and impurity centres in diamonds, trying to build hybrid platforms based on microwave quantum electrodynamics, and providing links to quantum optics. Research into quantum computing may have a long way to go, but progress is being made, with Europe very much to the fore. Eurosqip received funding under the FET-Proactive scheme of the EU's Sixth Framework Programme for research.